Full time role Monday to Friday 9-5 for an Office Administrator. This is an interesting and varied position to provide a proactive, confidential and professional customer focused administrative service ensuring consistency in approach and accuracy of advice. To liaise with all members of the Acorn Occupational Health Ltd team to support and assist them in their role of providing Occupational Health services. Administration and computer skills would be preferable, although this is not essential, as full training will be given to the right candidate. Salary based on experience and qualifications, 25 days holiday (plus bank holidays), Pension and Healthcare package available. Laughter Yoga helps to improve your employee’s mental and physical health. It is a practice of voluntary spontaneous laughter and is guaranteed to be a wonderful mood enhancer. Laughter Yoga is a 30 – 60 minute group session that helps alleviate stress in the workplace and helps us feel more relaxed throughout the day. Laughter Yoga is a practical exercise that involves breathing and stretching exercises, mindfulness relaxation and of course, lots of laughter. Employees will also receive tips of how they can continue this practice which will reduce stress levels and help boost their immune system. Laughter triggers the release of endorphins, the body’s natural ‘happy’ chemical. Laughter increases immune cells and antibodies which improve the body’s natural defence against illness. Laughter lowers stress hormones and helps to elevate tension, both mental and physical. Laughter increases the net supply of oxygen in the body which helps boost overall good health and aids concentration. for further information including pricing. Full-time or part-time role for an Occupational Health Nurse. This is an interesting and varied position and you would be part of a tightly knit successful team. The successful candidate will provide occupational health surveillance services for clients as well as carry out sickness absence fit for task medicals, promote health and well being. Applicants will ideally have an understanding of HAVS, Management Referrals and be up to date with their immunisation and venepuncture training. The successful candidate will also be fully qualified, however, full training and sponsorship to complete the occupational health nursing degree is available. By the very nature of this peripatetic role the ideal candidate will hold a full driving licence. Full time or part-time role for an Occupational Health Technician. This is an interesting and varied position providing occupational health screening services for clients under the supervision and guidance of Occupational Health Advisors/Nurses. Administration and computer skills will be required as electronic report writing, maintaining health records, audiometry summary sheets, spreadsheets and databases is integral to the role. Applicants will preferably have a background in healthcare with some knowledge of occupational health, although this is not essential, as full training will be given to the right candidate. By the very nature of this peripatetic role the ideal candidate will hold a full driving licence as this position may also include the driving of the Acorn Mobile unit (28 foot long vehicle). Salary based on experience and qualifications, travel allowance, Pension and Healthcare package available. 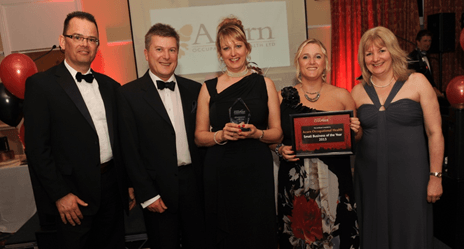 After winning the Customer Care Awards in 2009 and 2011 at the East Cheshire Chamber of Commerce and Enterprise Business Awards, Acorn Occupational Health Ltd recently picked up their third award for Business of the Year 2013 in the under £2M category. From Left to Right: Andrew Burrows, Adam Clarke (Director of Mitten Clarke), Isabel Burrows, Hayley Rhodes and Denise Short. This award is recognition of Acorn’s sound business practices and expanding customer base to which we are very grateful for their loyal support. Between June 6th and June 8th Isabel and Andrew cycled from Prestwick to the Isle of Skye to raise £949 for the Ruby’s Fund. The challenge was made a little easier by the near tropical weather and outstanding scenery. The mileage does not really tell the whole story as it was dwarfed by the 750 miles of training prior to the event, during Bank Holidays, in the driving rain.